With just 4 ingredients and a few minutes to whip up, this classic ENGLISH DESSERT is the perfect summer dessert! Always a hit whenever I make this! We had a holiday in England last June – perfect time for all that glorious English strawberries. Naturally, we’ve had many a desserts that use these yummy berries. Our favorite of all is this English classic — Eton Mess. You know why? 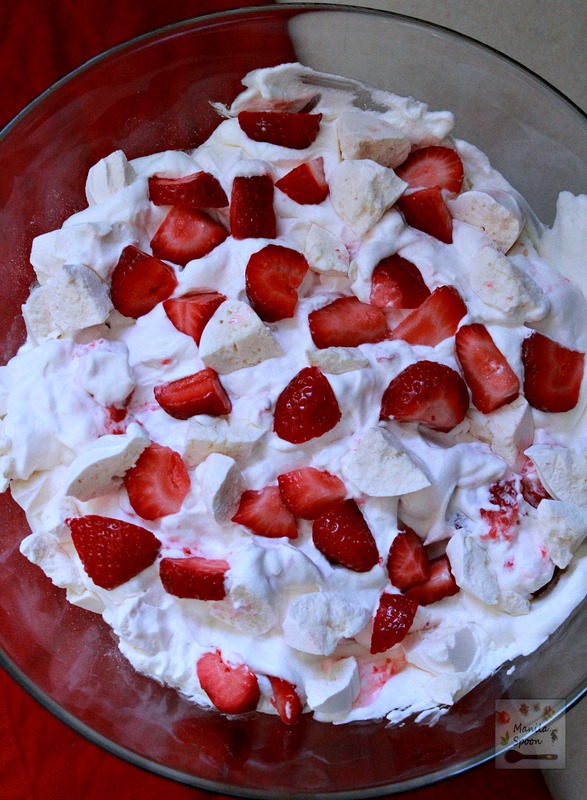 It wasn’t only delicious but has just 3 ingredients — meringue, cream and strawberries!! When you use store-bought meringue (which I do) all you need is 10 minutes to make this awesome summer dessert!! Intrigued? Read on…. I have served this a few times already and everytime it is well-received and the recipe often asked. It’s funny because it’s so easy I feel like it doesn’t really even need a recipe. However, for the benefit of our dear readers who, perhaps, are not familiar with this delicious dessert, I write this recipe – this is my gift for you!! Make sure you don’t miss making it this summer while fresh and seasonal strawberries abound. I promise you won’t be disappointed!! Enjoy! With just 4 few ingredients and mere minutes to whip up, this classic English dessert – Eton Mess – is the easiest and yummiest dessert you can make with your summer berries! Always a hit whenever I make this!! Whip the cream and icing sugar until soft peaks form. Fold in the broken meringues and strawberries leaving a few pieces for garnish. Serve immediately. Easy-peasy deliciousness!! I’m not familiar with store bought meringue. Where in the supermarket would you find it? I think you need to ask your own grocery if they carry it and where. I get mine from Trader Joes and I think it’s in the cookie section but I’ve seen some of it in either in the candy section or sometimes near the fruits so it could be anywhere.